From the July 26, 1937, issue of Life magazine. 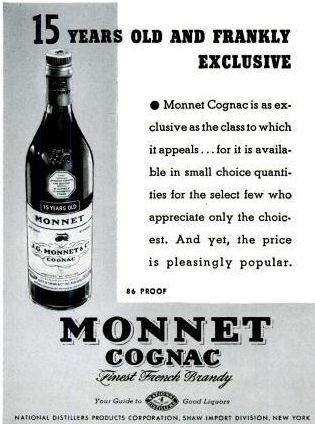 Monnet was not quite 100 years old at the time of this ad, having been founded in 1838. The brand still exists. Compared to some of the advertising posters that Monnet commissioned, this Life ad seems pretty drab. So, I get a lot of PR pitches. Most cocktail, wine, and food bloggers do. Some of them are smartly targeted and personalized, but many of them are just kind of dumb. I opened my Gmail account one day to see an email that started “Dear Dash.” An amusing nickname, true, and I suppose that’s better than the “Dear <vname>” message I got one day. And, frankly, I can’t even begin to imagine what the PR folks for Women’s Health magazine are thinking in sending me information on dieting, women’s nutrition, and Madonna’s organic lifestyle. Hope all is well. I couldn’t help but notice, from reading your blog, that you have a thing for ginger. Pitch-perfect PR. By my rough count, there are… let’s see… 1, 2, 3, 4, 5, 6, 7, 8, 9, 10 posts that feature or mention something gingery as a drink ingredient. So thank you, Yun Yu, from Fox Greenberg Public Relations, for actually paying attention to what I do and what this blog’s about–not specifically ginger, but about creatively pairing strong flavors and fresh ingredients with spirits. The opening nose is reminiscent of pears poached in cinnamon and wine. The first sip reveals a moderate amount of heat, which dissipates quickly leaving behind an extended finish of basic sugars, pear, light caramel, vanilla, cinnamon, nutmeg and banana. I find it just a little too sweet to sip neat or on the rocks, but it blends beautifully into cocktails. I think my favorite use for it is in a sidecar variation, with lime juice instead of lemon, and the triple sec reduced just a smidge. I also find that it pairs well with rum, in an old-fashioned, with Fee’s Whiskey Barrel Aged Bitters. In fact, the marriage of pear, vanilla, and Fee’s warm Christmas spices reminds me so much of Yuletide that I’m going to tuck some of the Xanté away for the holiday season. Now, what’s this to do with ginger? Well, Yun, in contacting me, suggested the Xanté Ginger Martini cocktail. I know, I know, I know; I’m not crazy about the name either. A martini is strictly a drink with gin and vermouth and maybe some orange bitters. It’s not a drink with cognac liqueur and anything else. But call it what you may, it’s a damn fine drink. Here’s the recipe as Yun sent it. In a mixing glass, muddle the ginger. Add Xanté, lemon juice, and simple syrup. Shake over ice, strain into a cocktail glass, and float garnish on top. Tell you what. Not only is this a fine drink, where all of the elements play well together, but the ginger really helps to bring the pear to the fore. And as we found out last night, Spanish Marcona almonds make a perfect accompaniment to this cocktail. I almost didn’t want to have dinner. About a month ago, Gary Regan devoted his SF Chron column to examining the intersection of food and beverage. I’m not talking about pairings, but instead food as an ingredient in cocktails. The technique of fat washing is an example of what I mean: you take some bacon, for example, and steep it in bourbon for a while. Remove it, fine strain out the solids, and then freeze the bourbon. The spirit itself won’t freeze, but the fat that’s suspended within it will rise to the top, which makes it easy to remove and discard–or reuse, I suppose, if you’d like some bourbon-flavored lard for any reason. Think about chilling a chicken stock after you’ve made it; same thing happens with stock that happens with bourbon. Now, Gary went on to describe something that isn’t really much like fat washing at all; in fact, it was such an abrupt segue that I think it didn’t really belong in that particular column. 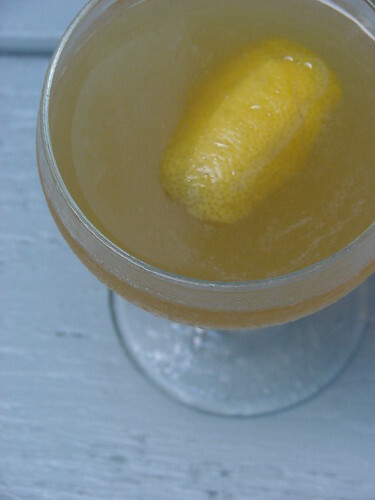 What he described was a drink called the Canary Flip, a drink created by a Brisbane bartender. A flip, if you don’t know, is a drink made by shaking up your drink ingredients with a whole egg. Flips were common in colonial times, but today, only cocktail geeks like me seem to make them anymore. Shame, that. I mixed up the Canary Flip recently, and Jen and I loved it. It was a good use for Fernet Branca, a bitter Italian aperitif that many drink straight. I can’t really stand it on its own, but it’s good in cocktails, when it’s in balance with the other flavors. It’s absolutely perfect in the Canary Flip. 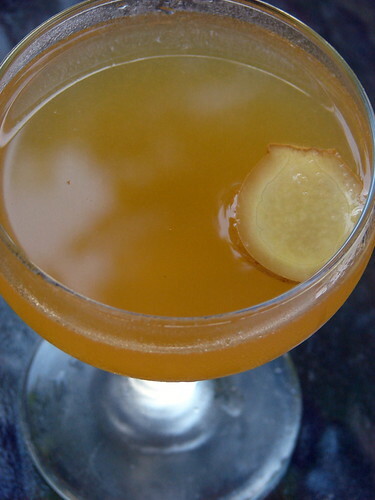 In this drink, it’s mixed up with Chartreuse, cognac, simple syrup, and the aforementioned egg. 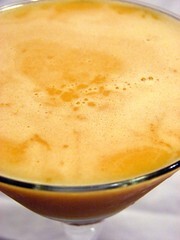 The result is a delightfully complex drink, herbal, rich, and creamy. It’s not at all cloying and it has a wonderful mouthfeel. This one’s a keeper! Instructions: Fill a cocktail shaker with yellow Chartreuse, Cognac, simple syrup, Fernet Branca and egg. Shake without ice for 10 seconds to emulsify the egg. 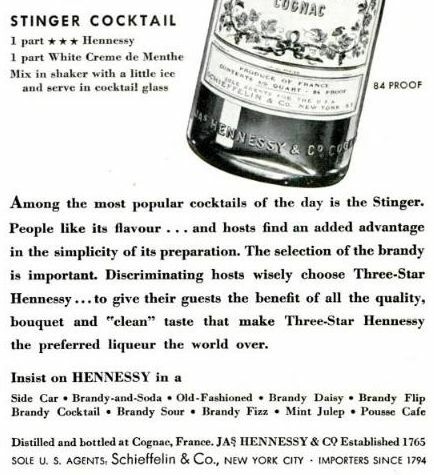 Add ice, shake and strain into a chilled sherry glass. Add the lemon twist garnish.